Matanya’s Hope found me when I had nothing to eat and gave me food. 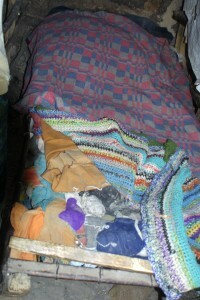 I was in tattered clothes and they bought for me uniforms and shoes and gave me a blanket for warmth. Surely you restored my dignity and hope. I cannot really explain my love to you. You have made my dream real. I keep on moving towards my goal. Your gifts I treasure them most. I cannot stop looking at your photos. for you have taken me as your child. A mum to me you have been. A role model your children are. I still remember that you are working hard. This entry was posted in To Our Sponsors on January 21, 2015 by Michelle Stark. Life is good, even in the face of adversity. You just have to hold onto hope. 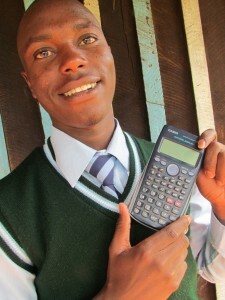 Matanya’s Hope gave me everything : even this wonderful calculator! My name Is Phineas Kaimenyi. I am a Kenyan and I live in in the remote mountains of Meru County in Kenya. 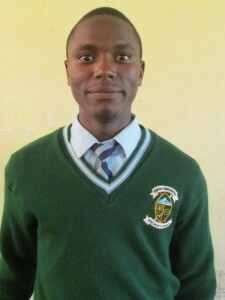 I am currently a form three student, known to you in the USA as a Junior. I attend Nanyuki Boys High School and am the first born in a family of three. When I was in class two my father left home and went away. No one in my family – including my mother has any idea of where he went. Honestly, I miss my dad every minute of my life. This made my life seem hopeless until God proved to me that He could work in a way different from what men think – by the time you are through with reading this, I assure you, you will agree with me that God has been amazing in my life. Since that time, my life became hectic – my mum could not support us with our basic necessities – I know it pained her to see us suffer but she had no means. Have you ever slept on an empty stomach for a day or two? This was part of our growing up. Two days hungry was normal to us, but it hurt. My mum went out seeking a job that at least would give her something to put on the table but do you think anyone cared to know what she had been through? The only job available for my dear mum was to sell drugs! Honestly, this pained me so much since, other than just selling the drugs which I knew was not what any one in their right would want their mother to do, it involved associating with people of all sorts – even drunk men! It always pained me to see my mum live such a life but there was nothing I could do – to tell you the truth it just made me feel miserable and so hopeless. Despite the effort that my mum had in this business, it was not well paying at all. The money she got was not even enough to cater for our food. We could not afford to buy clothes. We felt like we were just shadows of life. Though I love school and I knew how desperate I was for education, I could not afford the fees. I wanted to study and change my family – I wanted to feel some hope but there was none! I struggled every day to find the coins demanded by school so that I could attend class. I struggled this way until I finished std 8 (8th grade). Many were the days that I failed and had to exchange my desire for books to work in someone’s fields: digging, planting, weeding…from sun up to sun down and yes, hungry. But, no matter my absences, at the end of the year in std 8, I sat for my class eight exams. Here in Kenya, the marks you get on these exams qualify you to join high school. By God’s grace I attained 320 marks! This was a miracle considering the many times I never went to school – and even when I did, it was on an empty stomach. I qualified to join a good school in Kenya but this was not even heard of in my family. Getting to class 8 itself was an achievement. I desperately wanted to join high school but where could I get the fees? How could I even tell my mum that a school principal somewhere demanded that I pay fees? I only made a prayer to God, though by then I didn’t even believe He existed. I confronted my Primary school head teacher about my trouble in raising the required fees. He was touched by my story and suggested that I go and look for this man who happened to work with an American based organization which sponsored needy students. The man’s name was Julius. I was desperate and would not give up until I found him! Funny enough, success shined during our meeting and he invited me to repeat std 8 in hopes that I might get a sponsor within that year. 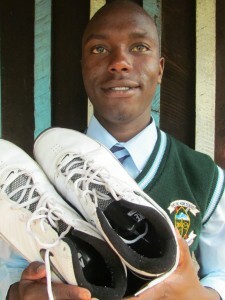 If we could manage to secure a sponsor, I would have hope to continue my education through their support and love. This I agreed to without much struggle at all. I worked tooth and nail to perform at my level best! I knew where I came from. I needed to believe in change. I was introduced to Michelle Stark who, since then, has proven to be my heaven sent. She gave me blankets and soaps, toothbrushes and toothpaste, pencils and so much I could not believe my eyes. But most important, Michelle believed in my story. She saw something special in me and told my story to Patrick Ormsby, who became my beloved sponsor. What a miracle! 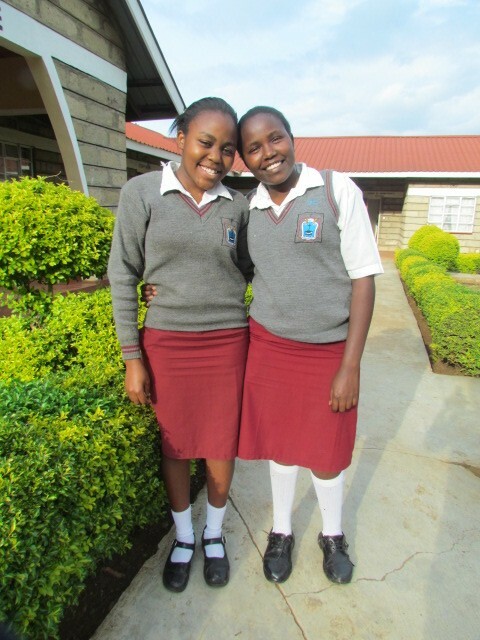 I am Phineas, standing before you in my High School Uniform made possible by Matanya’s Hope and my dad, Pat! I was happy to be sponsored by Pat. This was a miracle and I could not ask for more. My hopeless life was now transforming before my own eyes. I could now confidently talk of a brighter future – of achieving my dreams – of changing my family status. My dearest, my Mum Michelle, not only helped me to get a sponsor but also has been my solace and inspiration. She always makes sure that I am comfortable at school and even at home. She has actually found me a better place to live away from my drunken mum. This has increased my concentration in school. My Loving dad Pat has been so good to me. He is always ready to listen to me. I take him as a special gift given to me by our Heavenly Father. What a wonderful dad!!! My life experiences are teaching me the importance of giving back to others: helping them when they need help – giving them hope since I believe that there is always hope for us. I thank God for the good opportunity He gave me. I am using it to my maximum by working hard every day so that I will reach my destination. 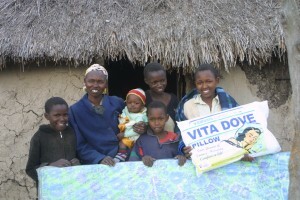 When I start earning, I will give back to the poor, helping them as Matanya’s Hope is helping me. I would love to tell everyone who is making sacrifices to support Matanya’s Hope that their sacrifice is changing the life of an individual who might never have had a way out of hunger, hopelessness and despair. 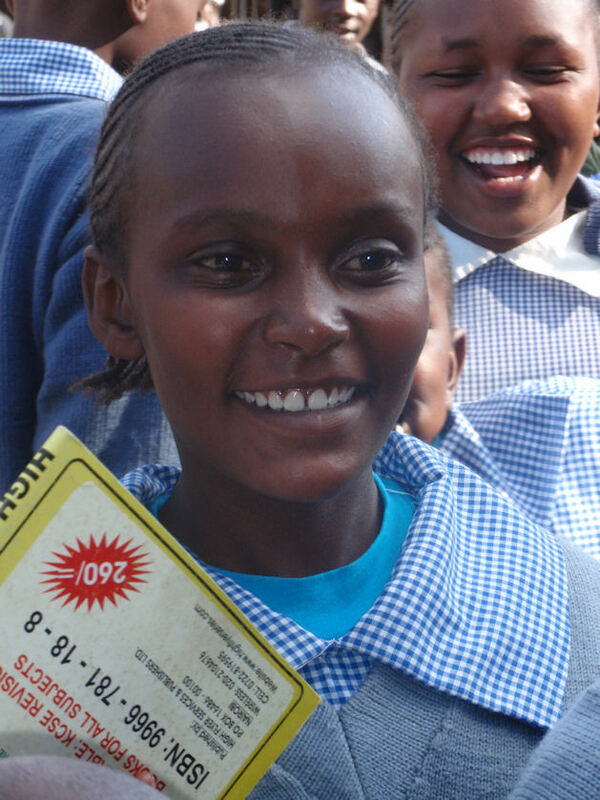 That coin that you donate may be just what someone here in Kenya has been asking God for. Special thanks to Matanya’ Hope and all who have been supporting this beautiful work that God started in Michelle. This entry was posted in The Children on January 20, 2015 by Michelle Stark. This is me in 2007 before I was sponsored. 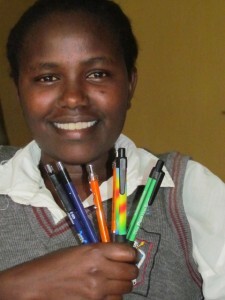 Matanya’s Hope gave me school supplies and shoes. I did not know that I would ever make a step ahead in my life. I lost hope in getting a good education. I lost hope in getting shelter. I lost hope in general. I had given up in life. Then came Matanya’s Hope. I thank God because of them; they are giving hope to many children who lost hope in life. I being among them. 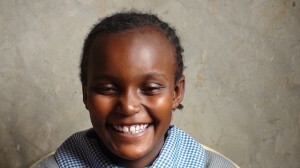 Matanya’s Hope has changed the world for me and my family. In 2008, my whole life was transformed from hopelessness to hope… one level to another. I was brought up in a family of six children. My parents were not able to provide us with basic needs such as soap, tissue paper, or even a pencil for school. Sometimes, we had no choice but to go to bed without food. Education was also a tough struggle for my mum and dad who were jobless. Unless they worked for someone doing odd jobs, we did not have money to buy food. My parents did not earn enough money to support our education and therefore, one of my brothers and sisters dropped out of school in class five. During that time, my sister and I were in nursery school. We missed a lot of school because there was no money for our school fees. This is the bed I slept in with my 3 siblings. We did not have a mattress. We used torn clothing to fill the spaces between the wood. In 2003, Kenya announced FREE PRIMARY EDUCATION; I passed the interview well and I joined class one. I had to stay at home for one good year without going to a single day of school because we could not afford the books and pencils. They were not available to me. The next year, I managed to go to class. My parents struggled to buy me one thin book of a few blank pages which I used to write all the subjects in. I worked very hard and I used to be among the top students. I was given books and pencils as rewards and therefore, I was lucky to get some more supplies through my hard work. I finally had hope to continue with my education, but in 2005, when I was in class 3, my dad passed away. I was only 10 years old. I wept so much. Life after his burial became very tough for all of us. We could not support ourselves and when we needed the support of our extended family, they started turning against us. They threatened to grab our land and make it their own. They forced my mum to leave home and she knew that she did not have a choice but to go. She left us behind… we were now on our own. My sister and I had no choice but to abandon school so that we could provide for the rest of our family. Among them was my little brother who was a toddler of two years old. We struggled too much and it was after a lot of suffering that our grandmother started taking care of us. She loved us so much but the same relatives who wanted to grab our land also did not want her to support our family. Matanya’s Hope built us a new home. They gave us all we needed to be comfortable. She provided us with food and took care of my little brother. My sister and I returned to school. The pupils were now very much ahead of us but we tried our best to catch up with them. It was no use; staying at home for that long caused my marks to drop and my position was taken by someone else. This hurt me so much. I refused to quit. I pulled up my socks until I came back to my position. My teachers were very happy. They helped me by giving me text books. IN 2007, my sister was introduced to Michelle by Mr. and Mrs. Mugo. Through them, my sister’s life was never to be the same again. She was provided with clothes, shoes, and many items of which I also benefited from. 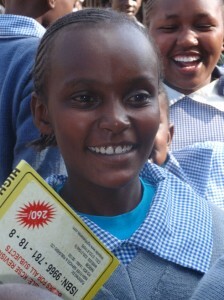 In 2008, she was taken to a boarding school where her education was much better. 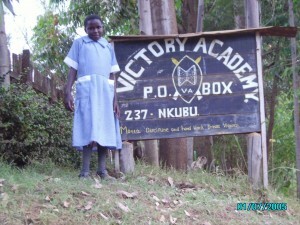 She was provided with all of the books, uniforms, bedding, supplies, and even the toiletries that she needed. I was elated to see my sister in a good school. I found myself believing that we would make a step ahead and that our lives would never remain the same. 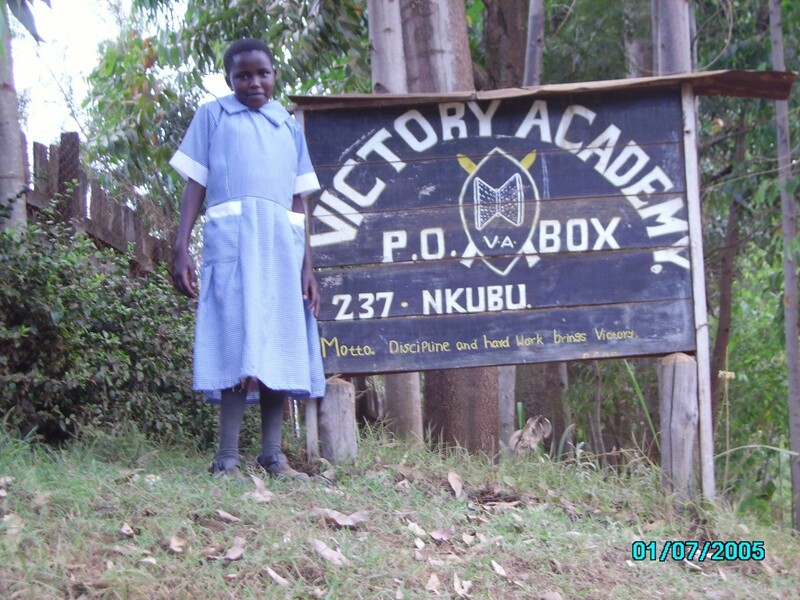 Me standing in front of the Victory Academy sign. This was like a dream come true! I was going to boarding school! I benefited too. Mr. and Mrs. Mugo introduced me to Michelle in 2009. I was taken to the same boarding school where my sister studied. I was so happy and worked hard to ensure that I kept my top position. The family was still intending to cause us harm; they were not happy and envied us openly. They refused to be associated with us and separated themselves from us during any family celebration. Though they did this to us, I am very proud of my grandmother who supported us and encouraged us to work hard in school and to put God first in all that we did. 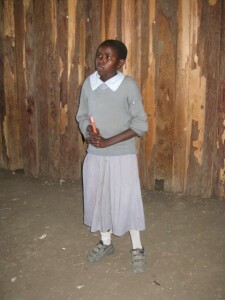 She also encouraged us to use the opportunity that Matanya’s Hope and our sponsor Tim had given us. I spent my vacations from school near my grandmother for her good stories. Some made me laugh, some encouraged me never to give up in life; others acted as a warning. Through her, I learned to cope with life. But our time was short. In that same year, she passed away. I got the information when I was at school. I wept too much. Our director encouraged us. He told us that she passed away from old age. But she was the only one who loved, cared for and supported us. It was during her burial that my mum came back and she took us to live with her. Matanya’s Hope gave us a better education. It gave me hope for a future life. I know that my dreams will materialize. Matanya’s Hope provided our family with a shelter which was built for us to live in and to study in. They provided me with clothing, bedding and even sheep which enable us to earn a living. We sell the offspring when we have a need to be fulfilled. 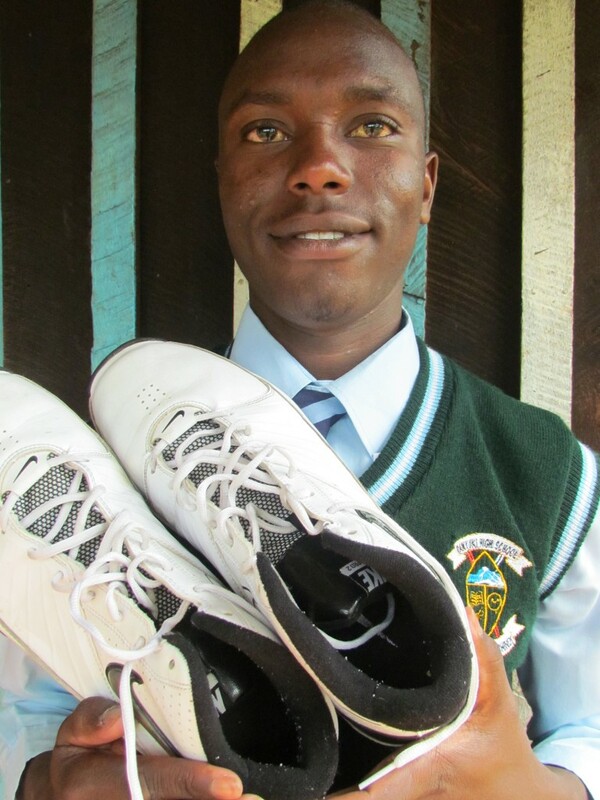 Our sponsor and Matanya’s Hope are taking so many people from my community to new heights. This photo was taken during the most recent mission. I am holding some of the pens given to me. Bless them for all they do! I found encouragement through them that it is not all lost; there is still way for a better tomorrow. I pray to The Almighty to bless our program so that it can change other people’s lives too. There is no discrimination here, regardless of status, tribe or colour. Matanya’s Hope supports all kinds of people from Kenya and beyond. I believe that I will make it in life. My dream is to become a teacher. One day, it will be me giving hope to students. I know I will support needy children as I am being helped today. God bless Matanya’s Hope forever and ever. Me and my best friend in High School. It is a miracle that I am here at such a great institution for learning. Imagine, this is my old school. Though the floors were dirt, I was happy to be in school. This entry was posted in The Children on January 4, 2015 by Michelle Stark.